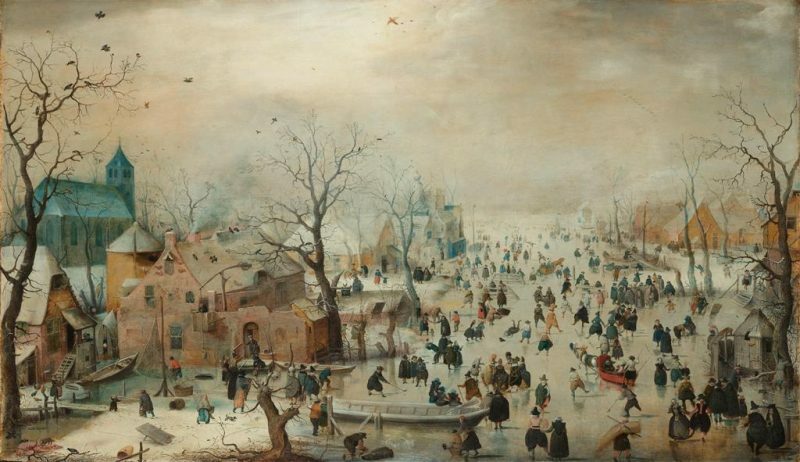 Since the Netherlands and Belgium were at the center of the Little Ice Age, it is no surprise that the winterscape painting emerged as a favored genre there in the seventeenth century. With origins in the allegorical depictions of the seasons from earlier manuscripts, the winter scene became a specialization. 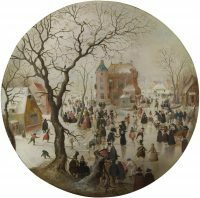 Its picturesque potential — ice, snow, and frost — is underscored by the names it took in inventories: ijsgezicht (ice view), winter, and winterje (the Dutch diminutive for winter), and, in England, frost piece. Return of the Hunters (1565) by Pieter Bruegel the Elder is recognized as an archetype for the genre. Created for an Antwerp patron as part of a series of the seasons, its bird’s-eye perspective across a valley of ice and snow was replicated in prints that traveled north. Adriaen van de Venne. Winter Landscape with Skaters near a Castle. 1615. Oil on panel. Image and data provided by Worcester Art Museum. Hendrick Avercamp was the first Dutch artist to take up the genre in works like the Winter Scene (c. 1608/09), where the high viewpoint prevails. A teeming skating scene, boisterous and replete with humorous detail — a snowball fight at lower left — is the antithesis to the misery that winter could wreak. 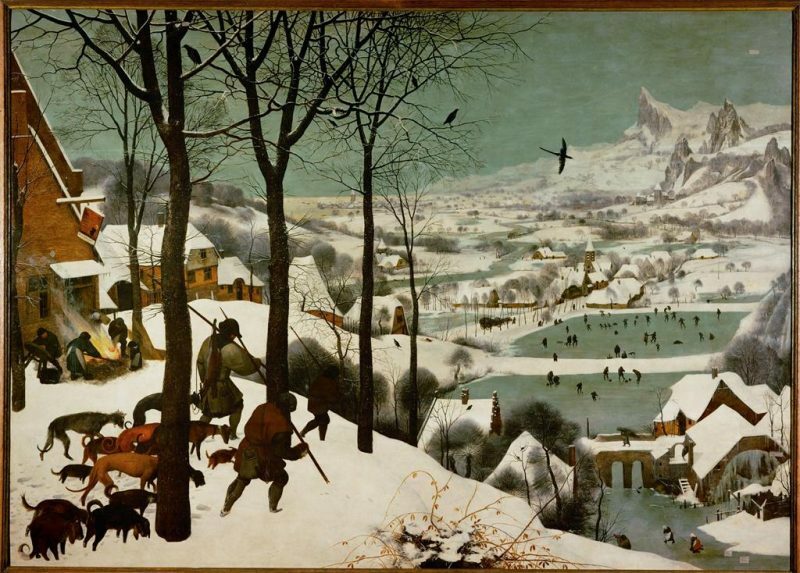 The date of the painting coincides with the disastrous winter of 1608, “one whose like was unheard of in human memory,” as reported by chronicler and physician Dirk Velius. An animated scene by Adriaen van de Venne Winter Landscape with Skaters (1615) also belies the severity of the record cold winter the year it was painted. A close look reveals vigorous skaters and whimsical vignettes like the tiny upended figure at center. In the instance of both paintings — wintertje, small panels measuring a foot or less — the minutiae are best discovered with Artstor’s zoom feature. Of course, the biting cold necessitated bundling up in voluminous layers of fur and fabric. The line between function and fashion is blurred where a lady is befurred, hooded, and double-skirted yet she reveals a dainty shoe hardly fit for snow in Winter, an allegorical representation from a series on the seasons by Wenceslaus Hollar. Hollar was a prolific Bohemian etcher who lived in London and Antwerp and had an eye for fashion, among other subjects. His Winter is resplendent in a fur muff, sumptuous skirts, and a mask to shield her skin from daylight. Her attire is approximated by the garments of the many ladies who share the ice in winterscape paintings. While fashion is the outward subject in Hollar’s personification, an inscription reveals a deeper meaning: “The cold, not cruelty makes her weare / In Winter, furrs and Wild beasts haire / For a smoother skinn at night / Embraceth her with more delight.” “Winter” may be warmly dressed but she enjoys the heat of an embrace most of all. Hollar’s mastery is most famously illustrated by his Muffs (1647) a feast of textures and an ode to luxurious winter accessories. The gallant Kolf player on the ice, from a print series entitled “Figures à la mode” (1670-1685) by Romeyn de Hooghe (baptized 1645-1708) ostensibly presents an athlete (kolf was the Dutch hybrid of golf and hockey). Nonetheless, its sartorial splendor clearly eclipses the sport. Attributed to Adriaen Matham, after Adriaen Pietersz. van de Venne. Skating owls: How well we go together. 1620-1660. Engraving. Image and data provided by Rijksmuseum. 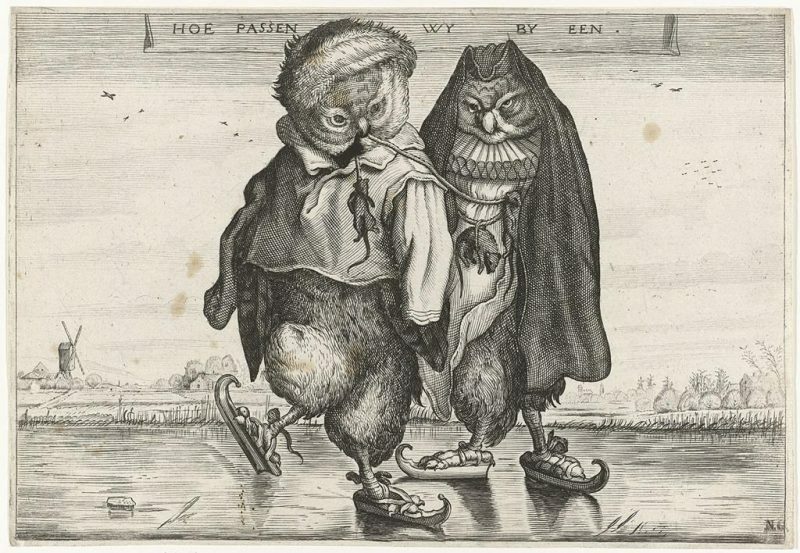 The attributes of the ice scene, fashion, and satire all come together in Skating Owls (1620-1660), an engraving by Adriaen Matham after a painting by Adriaen van de Venne. A painter of many genres (including landscape as shown above), printmaker, and poet, Van de Venne excelled at satire. His quirky owls illustrate the saying at top “How well we go together,” as in birds of a feather. The female owl is dressed in fine fashion, including a millstone ruff and a hoyke (a type of hood ubiquitous in Netherlandish winterscapes), the male in peasants’ clothes. They teeter along invoking the many Dutch proverbs that liken ice to danger and skating to folly, “slipping and slithering … through life,” (as inscribed on prints after Pieter Bruegel’s Skating before the St. George’s Gate). Even the most idyllic winterscapes like Avercamp’s expansive view of 1608 (below), harbor a double meaning. Amid the merriment, the chaos so artfully revealed in splayed skaters, stranded boats and slippery accidents admonishes: no skating on thin ice! Hendrick Avercamp. Winter Landscape with Skaters. ca. 1608. Oil on panel. Image and original data provided by Rijksmuseum. Parker, Geoffrey. “The Little Ice Age.” In Global Crisis: War, Climate Change and Catastrophe in the Seventeenth Century, 3-25. NEW HAVEN; LONDON: Yale University Press, 2013. http://www.jstor.org/stable/j.ctt32bksk.8.